Sesame seeds helps the intestines with proper digestion as it contains high fiber content in it. This seeds contains high zinc that helps produce collagen, aids in repairing damaged body tissues and gives the skin more elasticity. Sesame seeds oil helps in preventing the appearance of wrinkles and pigmentation as it prevents harmful ultraviolet rays of the sun from damaging your skin. 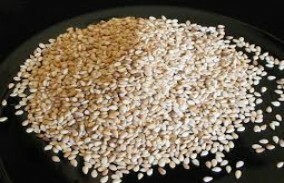 Sesame seeds helps in curing anemia as they are rich in iron. The zinc content in sesame seeds helps in boosting the bone mineral density and the bone health.